Pair of rear-mounted engines delivers up to 1,540 hp driving all eight wheels. OSHKOSH, WIS. (February 16, 2017) – Oshkosh Airport Products LLC, an Oshkosh Corporation (NYSE: OSK) company, will display its all-new Oshkosh® Striker® 8 X 8 aircraft rescue and fire fighting (ARFF) vehicle at the 2017 Fire Department Instructors Conference (FDIC) from April 27-29 in Indianapolis, Ind. Powered by a pair of rear-mounted engines generating up to 1,540 hp, the Oshkosh Striker 8 X 8 is the most powerful and capable ARFF vehicle in the company’s history. 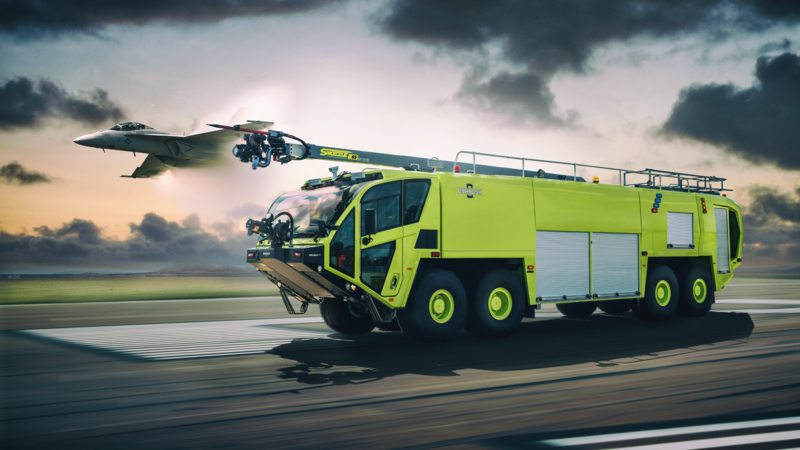 The new Oshkosh Striker 8 X 8 is the most powerful ARFF vehicle in the company’s history. The matching pair of Scania rear-mounted, Tier 4F low-emission engines deliver up to 1,540 horsepower, driving all eight wheels, for faster acceleration. (Oshkosh and Scania collaborated to make one of the world’s leading engine manufacturer’s engines available on the new Oshkosh Striker 8 X 8.) The company’s industry leading TAK-4® all-wheel independent suspension and legendary all-wheel drive componentry are, of course, also part of the chassis package. When the Oshkosh Striker 8 X 8 shifts into pump-and-roll, or firefighting mode, one engine will switch over and be dedicated to the water pump and firefighting systems. These systems include triple agent capabilities, a wide selection of bumper and roof turrets, and an available structural firefighting package. The Oshkosh exclusive Snozzle® HRET, with a hardened carbide steel tip, perforated nozzle, and increased range of motion (up to 280º) enables firefighters to discharge from five feet below grade to elevations as high as 65 feet, giving the apparatus maximum versatility while keeping firefighters further away from danger. In addition to its unmatched chassis and firefighting systems, the new Oshkosh Striker 8 X 8 will feature the latest advanced technologies. Among them is a 360-degree view “around-the-vehicle” camera system to provide unparalleled driver visibility, similar to systems found on higher-end autos and SUVs. Photo caption: Oshkosh Airport Products LLC will display its all-new Oshkosh® Striker® 8 X 8 aircraft rescue and fire fighting (ARFF) vehicle at the 2017 Fire Department Instructors Conference on April 27-29 in Indianapolis, Ind. The Oshkosh Striker 8 X 8 is the most powerful and capable ARFF vehicle in the company’s history. Oshkosh Airport Products, LLC, a division of Oshkosh Corporation (NYSE: OSK), is a designer and builder of industry-leading airport firefighting and snow removal vehicles. Its flagship Striker® Aircraft Rescue and Fire Fighting (ARFF) vehicle and Oshkosh® H-Series™ snow removal chassis are known for their durability and superior performance and sold throughout the world. For more information, visit www.oshkoshairport.com.